This machine is possibly best known as the computer that might have been the BBC Micro, as chosen by the BBC for their influential Computer Literacy project, if its owners had only managed to actually produce a machine in the year it held the BBC contract. However, these delays cost it the gig and the BBC went the way of the Acorn Proton, which was launched at the end of 1981. The Newbrain itself had been in gestation for several years, initially as a Sinclair Radionics project and then at Newbury - a company which was overseen by the same National Enterprise Board which had been sent in to manage troubled Sinclair - Clive Sinclair's electronics company in St. Ives. 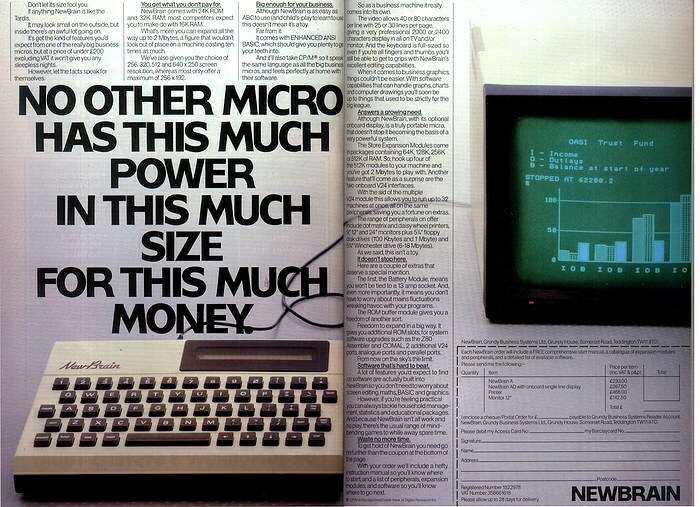 The truth of when the NewBrain was canned as the actual "BBC micro" is hard to pin down. The common story, as referenced already by Guy Kewney in Personal Computer World, was that NewBrain had been selected early for the BBC's project and then dropped at the last minute, but an article on The Register suggests that likely delays in upgrading it to suit the programme's requirements meant that it was probably ruled out early on. In fact, according to a report by Nesta and the Science Museum in 2012, Newbury had been chosen because its part public ownership would have meant that the BBC would have avoided getting tangled up in any dubious commercial contracts or being tied to a big commercial company. However, because the company still hadn't produced anything by the end of 1980 it was dropped, much to the BBC's despair, and the contract was opened out to Acorn, Tangerine, Research Machines, Sinclair, Transam and Nascom. The list was carefully selected and was kept deliberately short in order to prevent being overwhelmed by bids, but was also chosen to filter out companies with "no reliable track record" as well as keep out possibly dominant Japanese and American companies. Had the NewBrain appeared in 1980, when it was first announced, it would have been fairly revolutionary, particular in terms of hand-held computing. It had 32K of memory which was expandable up to 2MB - a big number in 1982, and it included BASIC with a compiler, which was also fairly unusual. The model with a built-in single-line display - the NewBrain AD - retailed for £267.50, about £970 in 2019 money. By the summer of 1982, when Minister for IT Kenneth Baker was opening Grundy's R&D labs in Cambridge, the NewBrain's manufacturer - Thorn EMI Datatech - had ramped up to "high volume production" at its plant in Feltham. The plant could churn out around 3,000 micros per week, but presumably didn't have to for too long as only 50,000 NewBrains were sold before Grundy, which was by now the owner of the NewBrain project having picked it up for a rumoured £600,000 in 1981 when previous owner Newbury Laboratories merged with its subsidiary Newbear and announced that it was going to produce a different micro instead, shut down its Business Systems unit in 1983. Employees were given only 24 hours' notice whilst the fate of the company was being decided during the week of the 25th August. One member of staff, as reported in Personal Computer News of that week, said "[Liquidation] has been on the cards for a while. We've expected to be on 24 hours' notice since June". It was said that expansion bought about by the imminent release of the CP/M Newbrains and a text-book mistake of increasing capital to manufacture quantities based upon Christmas sales figures from the previous year, all of which came on stream during summer as sales were falling, led to "massive debts". By September of 1983 it was all over. Liquidators from Deloitte, Haskins and Sells had been appointed during a creditors' meeting on September 8th and were hoping to start talking to potential buyers during the week of the 15th. Despite winding up with debts of £3.5 million (about £13 million in 2019 terms), of which £940,000 was owed to the software house Thorn-EMI and another £178,000 was owed to Peachtree software, the creditors still had some faith in the company "if only a serious and sensible management team could aim it at the targets it was designed for". Time was of the essence though, as it was feared that public interest in the NewBrain would fade very quickly if it was left in limbo during a period of fierce competition in the micro market. Lasky's, considered as probably the UK's largest outlet for the NewBrain hinted at what would happen if the machine was orphaned. Mike O'Reardon, Lasky's London-area Group Computer Manager stated "we will withdraw them and possibly sell them at a reduced price without back-up", but that "we will carry spare parts for those [already sold] units for the next five years". Some other dealers and software houses had been rumoured to be considering a rescue deal of their own, as there was a certain amount of loyalty towards the machine and the recent release of a disk system had put it in to "serious business machine" territory. Software house Kuma had said that it would consider helping out in a rescue bid, and Alan Fish of Elstree Computer Centre was even more positive, saying "we would certainly get together with other dealers to save the product, which is very highly rated by dealers. I see a big future for the machine because of its high technology... the disk system is superb... You can't have such a high technology machine just stopping". The collapse of Grundy had an unfortunate side effect, as it meant that the machine lost its chance to become the official Norwegian schools' micro. Despite that loss, the NewBrain was once again reprieved when Tradecom International of the Netherlands bought it from Grundy's liquidators. It was thought that Tradecom's own survival rested to some extent on being able to fulfil orders it had taken for the machine. It was good timing as it seemed that users and third-party manufacturers were finally getting the hang of the NewBrain and were releasing more and more products for it every month. Owners seemed especially loyal and user groups were active, including one in Cambridge run by ex-Grundy engineer Gerald McMullon. In the first edition of the user group's newletter, McMullon identified the "beginning of the end" for Grundy as happening in November 1982, when Grundy's marketing department had been promising expansion units that R&D couldn't actually come up with. "Newbrain to be saved? ", Personal Computer News, September 1 1983, p. 5"